On Thursday our US authors and readers will be celebrating the Thanksgiving holiday. Unfortunately in Australia we don’t have a Thanksgiving tradition like the US and Canada. Many years ago an American friend taught me how to make a traditional Thanksgiving dinner. Roast turkey and mashed potato served with gravy and cranberry sauce is often part of our Aussie Christmas dinner menu. I will confess I struggle with the concept of pumpkin pie being a sweet rather than savory dish, and sweet potato casserole including marshmallows. We roast pumpkin and sweet potato and serve it with gravy. I prefer savory to sweet, and l do like the traditional green bean casserole. The thing I like the most about Thanksgiving is the tradition of sharing what you’re thankful for. It encourages ‘glass half full’ thinking where we focus on the good things we have in our life rather than complaining about the bad things we don’t like. We encourage an attitude of thankfulness in our family rather than entitlement. Instead of being focused on self, we talk about how we can help people and appreciate the help we’ve received from others. The Biblical principle of loving your neighbor as yourself. One thing I’ll always be thankful for is the opportunity I’ve had to publish my books. I’m thankful that I could attend a Margie Lawson Writing Immersion Retreat earlier this month to learn more about the craft of writing. Do you celebrate Thanksgiving in November? What are you thankful for this year? Hi Narelle! Thankful for family, health, a roof over our heads, and food on our table. God is good. Love turkey with all the fixings, including pumpkin pie. Best wishes. I worked with a Canadian guy years back and he invited us to celebrate Canadian Thanksgiving with them which was lovely. He was quick to remind us that he was Canadian, so celebrated Thanksgiving in October! As a kid growing up in North Queensland, we used to have a special Harvest Festival service at church- usually around the time of the sugar cane harvest. I’m with you- more savoury than sweet foods, and I detest pumpkin so not keen on pumpkin pie at all! Wemble. 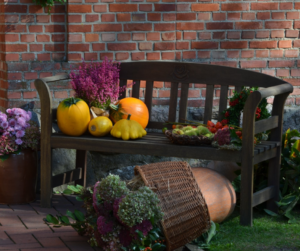 As a child, teen, young adult in our German churches in America and Canada we celebrated the harvest the first Sunday in October. So much to be thankful for. For this immigrant was special then to celebrate the historical significance of the American Thanksgiving in November. Blending culture is a a plus, especially for holidays. I’m thankful for salvation. Blessings from Germany to Australia. While we do love pumpkin pie, our sweet potato dishes are always savory here. That marshmallow prep is just not for us. And I know we aren’t alone. So not all of here in the US are turning them into candy. A Canadian Thanksgiving dinner (second Monday in October) is often a full-spread turkey dinner like in the States. My hubby loves turkey (no comments, now…) and would probably enjoy if we had it at least once a month! When I was growing up, we rarely (if ever) had sweet potatoes apart from the sweet, marshmallowy turkey-dinner casserole. I’ve come to love them savory and less artificial. Now I cook sweet potatoes about once a week and enjoy them a lot. Pumpkin…. oh, how I love pumpkin pie! It is one of the most perfect foods ever invented. We grow pumpkins and have been cooking them down for the freezer this past week. I freeze a lot of 2-cup packages for muffins, cookies, cakes, and breads, and a lot of 1/4-cup pucks for tossing in smoothies. Yum. Now I’m hungry. 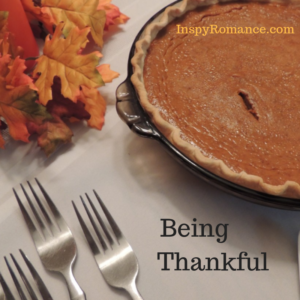 And thankful, not only for pumpkins and sweet potatoes, but for so many things. Life, breath, family, peace, the love of Jesus my Savior, to name just a few that are often on my lips. I also love the differences even in the American Thanksgiving. I’m from Upstate NY originally and we never had sweet potato anything, nor green bean casserole. All I know if I am ready for turkey! A seemingly small thing I’m thankful for this year is hearing aids that work! I lost 80% of the hearing in my left year 4 years ago, and technology then wasn’t good enough to help. Now the technology has improved enough that I’ve got hearing aids that make a big difference! I’m thankful to still have my mom after her being really ill in the hospital. I am thankful for my salvation, the freedom to worship, my family and friends and being able to volunteer at my local public library. Hi Narelle, yes, we celebrate in November! And this time we are very thankful for safety! We are surrounded by fires…air quality is hazardous. Schools are closed, we are trying to stay indoors as much as possible. We are praying for all those who is affected! Blessings! I’m thankful for many things, and this group is high among the list!